March Madness has begun, though that’s an endless cycle in today’s political world. No, Rep. Ilhan Omar (D-MN), you’re anti-Semitic antics did not just wash away, though the Virginia Democratic Party has gotten away with murder with their racist antics concerning, its governor and attorney general admitting to wearing blackface. The lieutenant governor has been accused of sexually assaulting two women as well. Congresswoman-elect Ilhan Omar’s support of the Boycott, Divestment and Sanctions (BDS) movement against Israel has some in Minnesota’s Jewish community asking questions, as before the election she reportedly called the movement “counteractive” to the goal of a two-state solution. 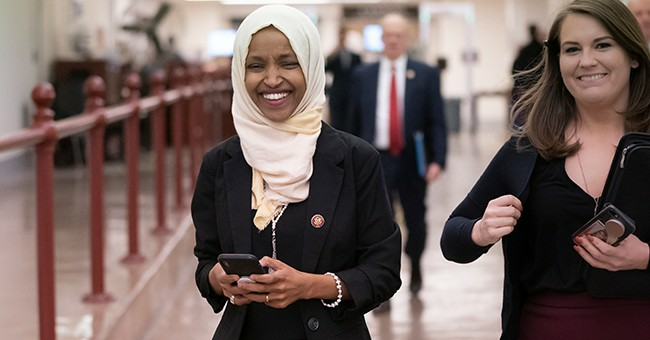 … the website Muslim Girl posted an article, saying that Omar’s staff told the blog Sunday that the congresswoman-elect “believes in and supports” the pro-Palestinian movement, which seeks to put international pressure on Israel. … TC Jewfolk, a website focusing on the Twin Cities Jewish community, took issue with Omar’s stance on the BDS movement, noting that it didn’t appear to gel with what she said to the Jewish community before being elected to Congress. In August, ahead of the DFL primary contest, Omar said at a candidate forum that the BDS movement was “not helpful” to the ultimate goal of a two-state solution, TC Jewfolk reports. When asked specifically by the moderator about her position on BDS, Omar replied that it was “counteractive” to getting both sides to come to the table. … TC Jewfolk reached out the congresswoman-elect to clarify her position. In a series of screengrabbed text messages posted to the TC Jewfolk website, Omar says that her position has always been the same: that she believes and supports the BDS movement. She defended her answers at the forum, saying that nothing she said was politically expedient. That’s not the least of it. As mentioned prior, her history of anti-Semitism should have anyone looking for the exit when she brings up this ongoing conflict. The alleged anti-Semite is going to push for a solution to this crisis. Yeah, not going to happen. Pelosi has defended Omar over her anti-Semitism foul-up, saying, pretty much, that she’s too stupid to know what she’s saying. I used to think this was a lame defense because, but maybe she is that dense. I mean, she is a Democrat after all. Either way, you cannot be a BDS supporter and support a two-state solution. Don’t bother asking her further on the matter, however. CNN tried that; Omar ran for the hills. I'm still waiting for someone to explain to me how @Ilhan supports a two-state solution *and* the BDS movement. They are mutually exclusive - the founders of the BDS movement have explicitly called for the destruction of Israel.